Can you Hand Write a Resume and Cover Letter? When you are applying for any job its important that you need to have a good cover letter along with your professional resume. But, you may be in dilemma whether the cover letter or resume be typed or hand written? Before we dive further into which one to choose lets try to understand what is a handwritten resume or what is a typed resume. Resumes and the cover letters are the things that present you in front of the manager or the staff interviewing you. It was long back when people used to write a resume or cover letter with their hands. But now time has changed as with the advent of computers the way of communicating has changed. Now people prefer to type the resume letters instead of resume writing with the hands. This is not preferred just by the aspiring employees, but also by the employers due to many reasons. The Handwritten Resume – How it Works? Think of giving a handwritten resume or the cover letter and it being unattended by the person on the desk? This might be due to the lack of professional look of the resume and the cover letter. This is because the company receives a number of resumes and cover letters in a day and your resume is tend to be ignored if it lacks the appealing appearance at first. As the technology has changed over the years, you are expected by the companies to be updated with the changes. So, if you will go with the same painstakingly written version, you might have to face the disadvantage of choosing for the typed resume. So, to avoid managers pondering over the issue of why you chose the handwritten method, go for the typed one. Always be on the safer side. Moving with a flow means you are known to all the changes in the society. You have the knack of awareness. This should strike into the mind of the interviewer when you present your resume or the cover letter. This is necessary because many people lag behind when it comes to the usage of the technology. Many are not aware, so you have to make them feel that you are not from any other planet but you reside on the same humanly planet earth. So, for probably this reason too, you have to go for the typed cover letter and the resume. This is something to ponder over of your own that what will be the reaction of person when half of your project is written and the other half is typed. Obviously, the reaction will be awestruck or maybe you have to encounter a frowned face. This exactly will be the reaction when your resume is typed while the cover letter is handwritten. This looks so awkward and is really out of the box, which is never appreciated. So, go for the typed cover letter as well as the resume. A manager or the HR person may receive more than 200 resumes in a day. So, what makes you think that your resume will be selected among those of two hundreds? No chance? What say? This is the time where you have to make a mark with the typed yet attractive resume. When you type, you do it in the Microsoft word etc. So, you get many new fonts and leverage to make the resume and the cover letter interesting and eye catchy. This you cannot do when writing a resume or the cover letter. This is so obvious, as you will not reach to pencil drawings on the resume to make it look attractive. But this surely can be done in typed one by using varied fonts, borders, colours in the resume as well as the cover letter. This is so obvious that the typed things give an edge over the handwritten ones. Not just because they give a professional look but also because it looks distinctive among other hundred resumes. When all the resumes will be typed, yours will have more chances of getting rejected just because you did not bother to type it and mail. So, its better to go for the typed one. 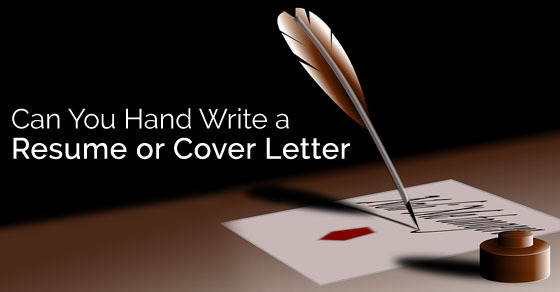 Handwritten Cover Letter – How it Works? If the resumes are not to be hand written then why a cover letter. It will look quite absurd if one of the thing is hand written and the other is typed. So, instead of making a fool of yourself, it is better to go for a typed cover letter. When you write a cover letter, you will not be able to mail it at the company’s email address. And it is but obvious that the time as gone into oblivion when the letters were posted, although it happens today also, but much to the lesser extent. So, it is easy to send the typed email cover letter than the handwritten ones. The cover letters and the resume’s destination is the company where you aspire to give an interview for the job. So, when you think of posting the cover letter along with the resume, do you really think it will reach the desired destination on time? No, not at all. The post cannot match the speed of the emails; those could be sent faster than the speed of light. So, the typed emails can be sent within no time and reaches the correct destination with the right email address. Customizing can be done when it comes to typing the resumes and the cover letters. But this surely cannot be done when handwritten. So, it is advisable to go for the typed cover letters than the handwritten ones. Also when you make use of the technology, it certainly provides you an edge over the old time-consuming writings. The software’s you make use when typing the cover letters provide a number of other benefits like editing, spell check and all. This cannot be expected from the eyes and the hands of humans to do that, as quickly as the machines and the software do. So, editing is easy on the computers. The spelling can be checked by downloading many softwares on the computer. Human may take time to check and correct the spellings reading between the lines. So, for this purpose also, it’s better to go for the typed cover letters. When you make use of a machine over the hands to perform a task, the machine will win the race and help you in saving your lot of time. Although it depends on the speed of the typing yet it is helpful to you with a number of other benefits also. So, to save maximum time, use technology to construct the resume and the cover letters. When you are searching for a job, you do not only send the brief cover letter along with resume to one company but also to many others at a time. So, it will be very difficult to go for a handwritten as you won’t be able to post it with different addresses, unless you write few of them. When you are asked to send the cover letter with resume inside, you will be expected with a quick response and not the letter you sent through the speed post that reaches a day after. So, choose emailing the typed cover letters and not the hand written letter. The companies usually have bundle of resumes with them and it is not sure if your resume will be selected on the spot when you send. So, over the period of time, the ink of the pen gets dull and it gives a bad impression. So, to prevent that, opt for the typed cover letters as the typed ones does not get faint, even if it is kept for years. The hand written things may get lost, after all it is a piece of paper but the cover letter you typed and resume you sent to the company will stay with them for longer period of time. So, to bear the loss of cover letters and the resume get missing, it is better to type the cover letters and the resume. The trend has changed over the years. Earlier the companies would ask the employees to come up with the resumes during the interviews but now the companies ask to first send the resume and then the further recruitment steps are taken. So, there is no fun of making a cover letter as the resumes are to be sent through mail. When you are summoned for the interview in the office, you will be expected to be professional in your look, the posture, the style and also the resume you will hold in your hands. So, if you will present a resume with the cover letter hand written, it will not only be non-professional but also it will create a bad impression. Putting forth the handwritten standard cover letter can raise number of queries in the mind of the interviewer like, do you lack access to the computer, or are you not aware of using the technology and what not, the questions can drop to any level, you never know. So, for that reason also choose to type the cover letters too, along with the resume. When you are asked to present yourself in the interview room with the resume, then you go through a number of queries and the most blistering query you can encounter be related to the cover letters. Why did you choose to write a cover letter when you have a typed resume? If you have gotten a solid reason to support yourself, then take a handwritten cover letter sample and if no, then simply reach out to the computer keys without mulling over anything. You might have a number of skills, experience in a particular field and even if you lack experience, you may have a number of other qualities to highlight. But the handwritten cover letter may leave interviewer blurring the skills and highlighting the question mark, thinking why you chose not to type the cover letter when you have typed the resume. So, this way the handwritten concept can take over the qualities you mention. Even if the lady luck smiles on you and the handwritten resume gets accepted, then also think of what impression would it create if you possess a doctor’s hand writing? Nothing will be understandable and even you will wonder on what basis you are chosen, perhaps on the grounds of the verbal skills. Also its your perfect cover letter from which the resume will be bought out, and if your cover letter will possess a bad hand writing, the chances of being selected may vanish. So, above are some of the reasons, one should choose the typed resumes and the cover letters than those of the handwritten ones. There are exceptions when the boss or the manager asks you to send a written letter, but such times are quite rare like out of 100%, only 1% can be the chance. At those times, it will be fine, but not every time. So, due to a number of advantages one must reach out to the typed resumes and the cover letters, not the hand written one.